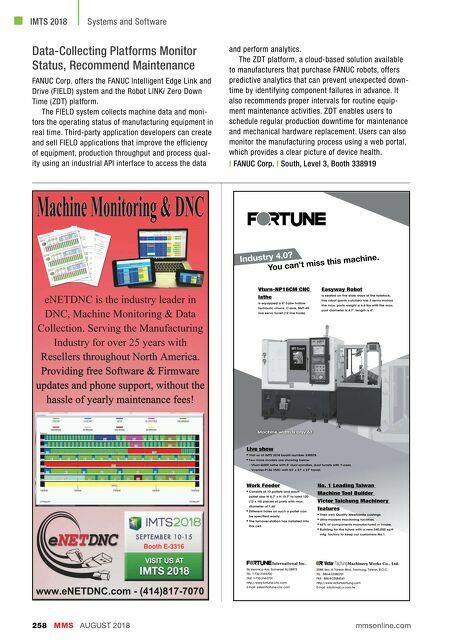 MMS AUGUST 2018 258 mmsonline.com IMTS 2018 Systems and Software Data-Collecting Platforms Monitor Status, Recommend Maintenance FANUC Corp. offers the FANUC Intelligent Edge Link and Drive (FIELD) system and the Robot LINKi Zero Down Time (ZDT) platform. The FIELD system collects machine data and moni- tors the operating status of manufacturing equipment in real time. Third-party application developers can create and sell FIELD applications that improve the efficiency of equipment, production throughput and process qual- ity using an industrial API interface to access the data and perform analytics. The ZDT platform, a cloud-based solution available to manufacturers that purchase FANUC robots, offers predictive analytics that can prevent unexpected down- time by identifying component failures in advance. It also recommends proper intervals for routine equip- ment maintenance activities. 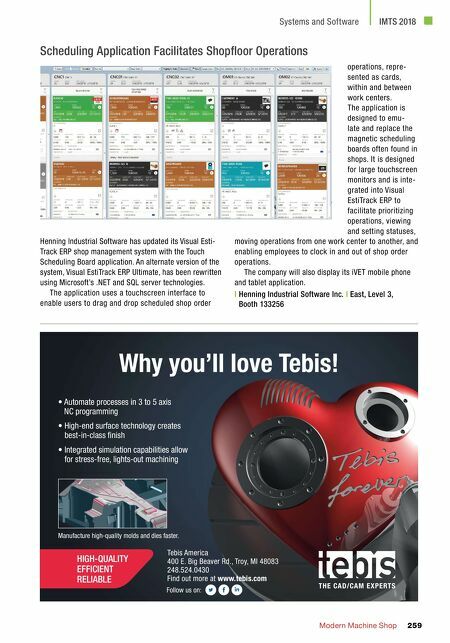 ZDT enables users to schedule regular production downtime for maintenance and mechanical hardware replacement. Users can also monitor the manufacturing process using a web portal, which provides a clear picture of device health. | FANUC Corp. | South, Level 3, Booth 338919 www.eNETDNC.com - (414)817-7070 Machine Monitoring & DNC eNETDNC is the industry leader in DNC, Machine Monitoring & Data Collection. Serving the Manufacturing Industry for over 25 years with Resellers throughout North America. Resellers throughout North America. Providing free Software & Firmware updates and phone support, without the hassle of yearly maintenance fees!